Neil Gaiman told me to be a dandelion. I asked my daughter what Neil meant by that. She gave me a convoluted response about caring less about making money and replicating the species than sending seeds of creativity out into the world. This was amusing information, coming from a daughter whose college tuition requires payment so she is eligible to see Neil Gaiman speak at her school. Silly me, for replicating the species. However, I am blissfully happy to be a dandelion. Gladly, Mr. Gaiman! Is there anything that reveals the contradictions in the human condition more than our relationship with dandelions? Dandelions produce the most vivid and beautiful spring flower in the landscape. They continue to bloom all summer long. When they go to seed, they’re still pretty, and then they’re fun to play with. If they’re living in a close-cut lawn, they bloom an inch from the ground. Unperturbed by overzealous landscapers, they can soar to a foot in height. Their leaves are edible: cooked, raw, or made into wine. It therefore follows logically that dandelions are the most expensive and popular plant at landscape stores. No, I’ve got that wrong. A whole industry revolves around chemicals created to eradicate the dandelion, to wipe it from the face of a verdant lawn, to eliminate it from cracks in the sidewalk, to keep it from intruding on the marigolds and begonias. A friend of mine who spent his life farming told me that a weed is just a plant that grows where we don’t want it to grow. This is the whole crux of the dandelion conundrum. While they are beautiful to look at, and fun to play with, and undetectable in a salad of mixed greens, they won’t grow by demand in orderly clusters. Even if they’re purposely cultivated in a garden, they’re quite unruly when it comes to sending their seeds off into the world. I’m very happy to be a dandelion, thank you very much. Pleased to meet you. I’m Anne Johnson, the weed. For most of my life I tried to fit into the cultivated bed, but not once did I ever sleep comfortably there. My imagination has run amok since childhood. I’ve never taken a vow that I couldn’t, or didn’t, break. The minute I seem poised to take root in one religion, one opinion, one behavior pattern, whoosh! Off I go to a whole new crack in the sidewalk. When he told me to be a dandelion, Neil Gaiman no doubt meant for me to send my creativity into the charming summer breezes to take root everywhere. The reality is that I’m a bright, flashy contrarian who takes pleasure in messing up the tidiest lawn. Cut me to the quick. I’ll still bloom. Leave me alone – all alone – and I’ll bloom just the same. Poison me with toxic chemicals, and I’ll … die. Oh, damn. That metaphor didn’t go as planned. This is my first column for PaganPages. I promise to be as coherent in the future as I’ve been this time. Deities of Disorder adore me. Anne Johnson, as tidy and predictable as the dandelion. Dandelion is a wonderful food as well as a beneficial medicine. It supports overall health by gently working to improve the functioning of the liver, gallbladder and urinary and digestive systems. It is excellent for cleansing the skin. An old companion of man, it has accumulated many names. Blowball and telltime refer to the seeds, priest’s crown to the stem after the seeds have flown, and swine’s snout to the unopened flower. And dandelion itself? The ‘teeth of the lion’ (dent de lion) explanation, from the appearance of the saw edged leaves or perhaps the tiny florets, is found in many languages. But there is also a case made for an older link to the sun. In many cultures the lion has been the animal symbol of the sun since antiquity, as the astrological sign Leo. Dandelions are yellow discs, like the sun and open and close along with it. So, perhaps the old name might mean ‘rays of the sun’ rather than teeth of the lion? It is high in minerals, especially potassium, and vitamins A, B, C and D. The young leaves boiled up into a tea or eaten fresh in salads are detoxifiers, clearing blood and lymph by increasing elimination through the kidneys and bowels. This in turn benefits overall health. If dandelion says ‘think spring’ it also suggests ‘think liver’. It has a reputation as a safe liver herb, especially where there are toxins and heat in the blood. The plant’s chemicals cause the gallbladder to contract, releasing bile, stimulating the liver to produce more. Liver related conditions aided by the dandelion include jaundice and hepatitis, gallstones and urinary tract infection, painful menopause, PMT and menstruation, improvements are achievable in the pancreas, spleen, skin and eyesight. It is the bitterness in dandelion leaves that makes them so good for your digestion. The bitter taste stimulates secretion of the digestive fluids, including stomach acid, bile and pancreatic juices. Dandelion promotes the appetite, and is recommended for those who have been ill or have lost their enthusiasm for food in advanced age. Roasted dandelion root is a well known and caffeine free coffee substitute. The root can also be eaten as a vegetable. The flowers don’t look very edible, but they are good eaten straight of the plant, mild and slightly sweet. Eating a few dandelion flowers often relieves a headache too. The flowers also yield a refreshing dandelion beer and a face wash. The sap or latex of the stems was once used in patent medicines, and was said to remove freckles and age spots corns and warts, to help hair grow and treat bee stings and blisters. 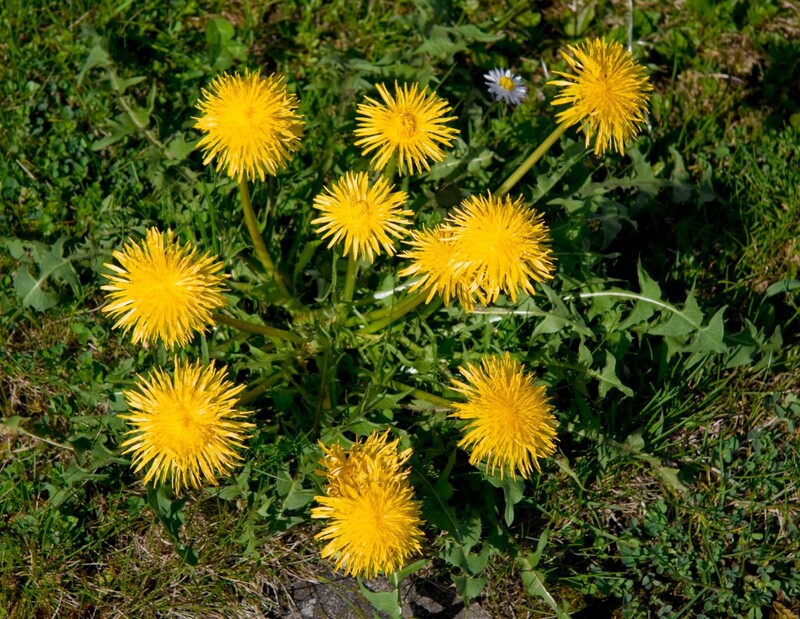 Dandelion is renowned for its diuretic properties, that is, increasing the flow of urine. What is less familiar is how well it strengthens the urinary system. It is effective in treating bed wetting in children and incontinence in older people. All parts of the plant have this effect, especially the leaves. With most diuretic drugs potassium is lost from the body and has to be supplemented, but dandelion is naturally high in potassium. It can safely be used long term without causing imbalance. The leaves boiled with vegetable peelings make a potassium rich broth. Dandelion’s diuretic effect makes it a good herb for treating swollen ankles for fluid retention and high blood pressure. It can also be used to alleviate shortness of breath in the elderly. As a medicine the whole plant is invaluable for liver and gall bladder problems, and for skin complaints including eczema and acne. Its action helps reduce high blood pressure, high cholesterol and the pain of arteriosclerosis and joints, digestive problems, chronic illness, viral infections and heart and lung irregularities. Dandelion can form part of a natural cancer treatment, and taken regularly as a food and medicine can help prevent some cancers, especially breast cancer and other chronic illnesses by keeping the body clean, toned and healthy. Drink dandelion tea or coffee to promote psychic powers. Leave a cup of this hot infusion by the bed to call spirits. Dig up the roots, trim off the leaves and stems and any small rootlets. Wash off the earth and scrub the roots well, leave them in a warm place to drain and dry. Cut any larger roots in half and into short lengths, spread the pieces on a shallow roasting tin and bake in a hot oven (400F, 200C, Gas 6) for 30 minutes until the roots are brown and dry all through. Allow to cool then grind. Spread the grounds on the roasting tin and roast them for 7 minutes in a moderate oven (350F, 180C, Gas 4). Put 5-6 tablespoons grounds in a warm jub, pour on 500ml/2 cups/1 pint boiling water, stir and stand for 30 minutes. Strain into a pan and re-heat. Gather the dandelion flowers in the sun, when they are fully open. The drink is very mildly alcoholic, sweet and quenching. Trim the stalks from the flowers, but leave the green sepals on and discard any overblown flowers or unopened buds. The prepared dandelions should fill a 1 litre/5 cups measure when gently pressed down. Wash the flowers in a colander and tip them into an earthenware, enamel or plastic container preferably with a well fitting lid. Pour the boiling water on to the dandelions, cover the vessel with a lid, board or weighted plate and leave to stand for 12 hours. Strain the liquid through a double thickness of muslin into a large saucepan. Add the sugar and the pared rind and juice of the lemons. Heat gently and stir until the sugar has dissolved, but do not allow to boil. Strain the liquid into jugs and leave to cool. Pour into clean, dry bottles with strong screw caps. Store in a cool, dark place. The brew is ready to rink in three or four weeks.